As regular readers know, I am increasingly worried about the level of stock prices. Stocks are now more expensive than at any time in history, with the brief (and very temporary) exceptions of 1929 and 2000. Importantly, today’s high prices do not mean that stock prices can’t go even higher. They can. And they might. What it does mean is that, at some point, unless it is truly “different this time,” stock prices are likely to come crashing back down, likely well below today’s levels. Just as they did after those two historic market peaks. Second, a chart from fund manager John Hussman showing the performance predictions for 7 different historically predictive valuation measures, including the “Shiller P/E” shown above. Those who want to remain bullish often attack the Shiller P/E measure, pointing out that it is useless as a timing tool (which it is). Those folks may also want to note that the 6 other measures in the chart below, including Warren Buffett’s favourite measure, same almost exactly the same thing. As you can see, the outlook for all stocks, but especially U.S. stocks, is bleak. Specifically, GMO foresees negative real returns for U.S. stocks for the next 7 years. Even after adding back the firm’s inflation assumption of 2.2% per year, the returns for most stocks are expected to be flat or negative. The lone bright(er) spot is “high quality” stocks — the stocks of companies that have high cash flow and low debt. Those are expected to return only a couple of per cent per year. 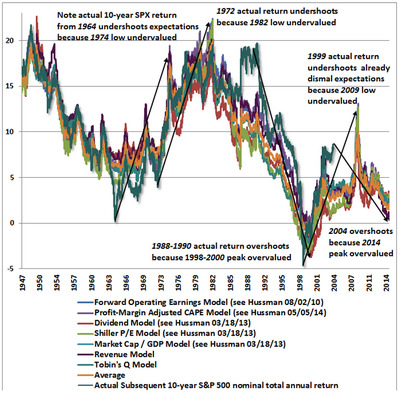 (Returns for international stocks are expected to be modestly better, but still far below average). The real bummer for investors, as GMO’s chart also makes clear, is that no other major class offers compelling returns, either. The outlook for bonds and cash is lousy, too. This puts investors in a real predicament. 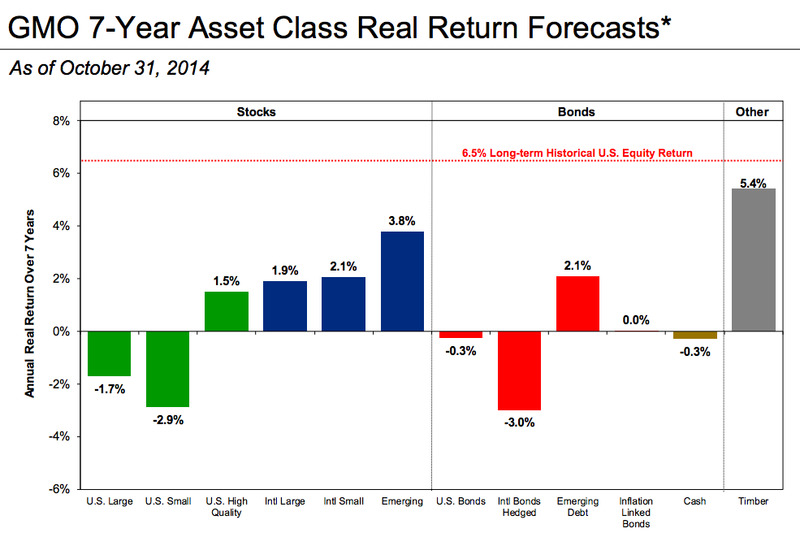 The only asset class forecasted to provide compelling returns over the next 7 years is… timber. And most of us can’t go out and buy trees. There is only one way that stocks will keep rising from this level and stay permanently above this level. 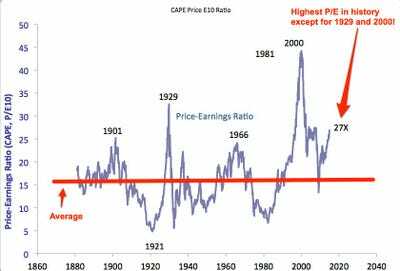 That is if it really is “different this time,” and all the historically valid valuation measures described above are no longer relevant. It is possible that it is different this time. It is not likely, however. And one thing to keep in mind as you listen to everyone explain why it’s different this time is that one of the things everyone does when stocks get this expensive is attempt to explain the high prices (and justify even higher ones) by looking for reasons why it’s different this time. That’s what most of us did in 1999 and 2000. For a while, we seemed “right,” and we were heroes because of it.